On the first page of his autobiography St. Augustine of Hippo wrote, “Lord, teach me to … praise Thee.” Then he wrote Confessions in praise of God. I wondered why, given the eloquence of his praise, he never set his prose to music. Music played a pivotal role in his spiritual journey. Music moved him deeply; he was intensely stirred by singing the Psalms. He was musically literate. His six books on music influenced music in the West for centuries to come. A history of hymn writing preceded him. His contemporaries wrote hymns. If Augustine wished to praise God, why did he not set his praises to music? · Music was an intellectual pursuit, not an artistic endeavor. · Studying the structure and components of music made sense of the world and man’s place in it. · Music could draw a person to God, but it gratified the senses. · Gratifying the senses took a back seat to intellectual pursuit. · Meaning was more important than emotions. St. Augustine was critical of his emotional response to music! God answered Augustine’s opening prayer in Confessions. His autobiography is filled with praise to God. I wondered, could I take Augustine’s written praises and turn them into praise music, something that Augustine’s view of music wouldn’t allow? Plainchant and responsorial singing were the genre of his day. But the exuberance of his praise suggests a music style that moves. Perhaps I owe St. Augustine an apology for setting his prose to swing. 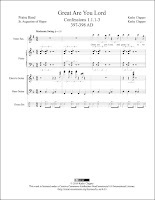 From the album “The HymnBook – Thirty-Four Hundred Years of Praise” this video is scrolling playback of the song. 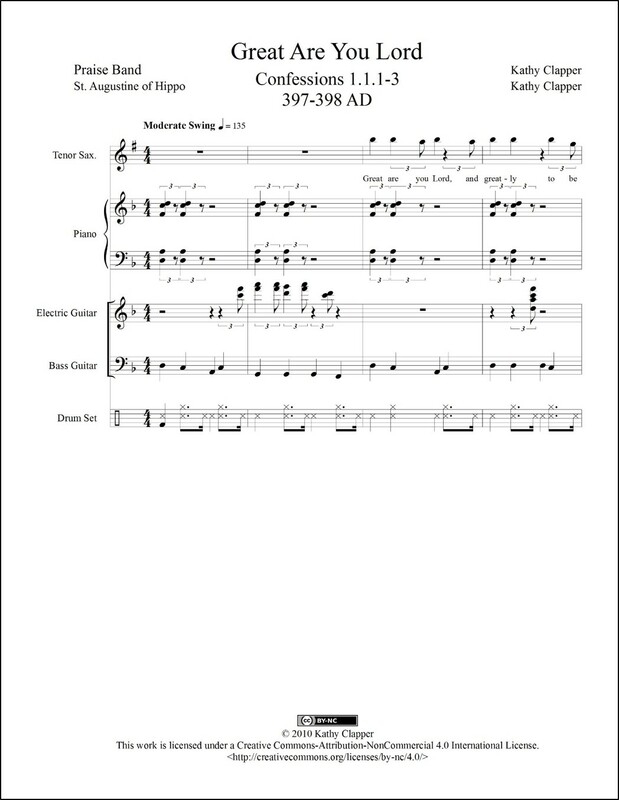 You can get print (PDF) and/or digital (MusicXML™) sheet music for Great Are You Lord. Click here for a modern translation of Confessions.